Who can defeat the titans? Rosalie Dumarque is driven to protect her home and to keep the protective walls standing. She’s been training hard and thinks she has what it takes to turn the battle for humanity’s survival around. She wants to not just keep the walls that protect the land from falling, but to regain those walls and areas that were lost. She defies her father and pushes him to allow her to serve for the months leading up to her arranged marriage. Assigned to Trost Gate Garrison, Rosalie soon learns that her wealth and arrogance are hindrances, some who were born in poverty were born soldiers, and not all soldiers serve with honor and protect the wall and their comrades. In fact, the corruption at the Garrison threatens those she admires and loves. It might not be the Titans that are her downfall after all. And the titans are horrific, ravaging, hungering humanoids who have only one goal: to devour all humans. Can Rosalie serve with integrity, preserve her honor, and protect those brave soldiers who serve with her? Can they hold the wall? I’m glad I didn’t know anything about Attack on Titan before I read Garrison Girl, because it’s not the type of manga or anime that I find appealing. I do, however, love all things Rachel Aaron, so I took a chance and grabbed the ARC on NetGalley. I’m glad I did, because this book stands on its own merits and was a blast to read. There is a lot to love about Garrison Girl, a strong heroine, a slowly developed and reasoned romance, strong friendships, a love of honor and justice, stand-alone world-building, and, at the end, a touch of hope. Luckily the horrific elements are somewhat played down in the book; most descriptions of the mayhem and predation are thankfully brief and not nearly as graphic as they could be. This book stands alone quite easily; you don’t need any familiarity with the world of Attack on Titan. 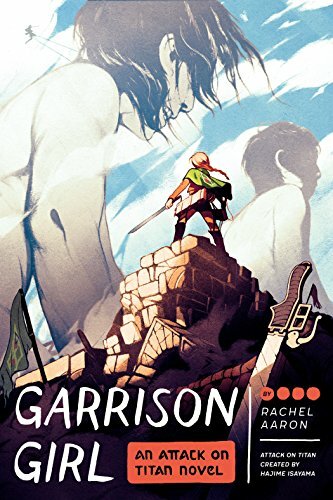 If you enjoy Rachel Aaron’s books, Attack on Titan, or steampunk/fantasy and can handle a bit of horror, you will enjoy Garrison Girl. Recommended with caveats for those triggered by cannibalistic-type activity or who are squeamish.